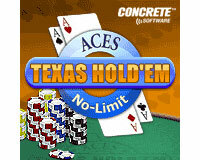 Aces Texas Hold'em - No Limit Poker Review for Palm, Windows Mobile, Blackberry and Java Phones. 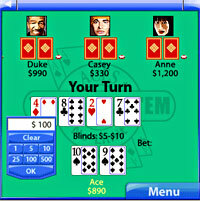 Highly addictive mobile poker game for Palm, Windows Mobile, Blackberry and Java Phones. If you fancy yourself as a bit of a Cool Hand Luke kind of character when it comes to gambling, then Texas Hold'Em No Limit poker is a great way to practice your skills when you're on the move. 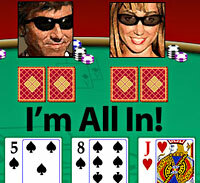 Available for the Palm OS, Blackberry, Pocket PC, Microsoft Smartphones and Java enabled mobiles, the game lets you take on up to 22 computerised opponents. It's played to the same rules as poker, except each player only gets two cards each, with five cards shared between all the players. The artificial intelligence of the computer players is said to one of the best available on mobile gaming platforms, and we certainly came across some tough opponents (although we expect that our miserable poker skills wouldn't challenge a BBC Micro version of the game, if such a thing existed). We tested the game on a Palm Treo 650, and it was easy to play the game one-handed, with all options available via the 5-way controller. The animated, well polished interface showed three opponents at a time, scrolling left to right to show other players (there's full support for all Palm screen sizes, from 160x160 up to 480x320 with horizontal display options). Fact fans will enjoy the Statistics screen showing details of hands played, hands won, folds, raises, tournament wins or, in our case, how many times we'd left the table without the shirt on our back. For the asking price of $20, this a great little game for passing away spare hours on the train (or perhaps wasting time at the office) and for poker fans it could prove a nifty way to hone your bluffing skills. Despite our lamentable skills, we found it to be an entertaining, addictive and fun game and - dare we say it - we actually seemed to be getting better after a few hours play. But perhaps we won't be booking that plane to Las Vegas quite yet.